DO YOU STILL DO THIS? - General Discussion - Mobile Legends: Bang Bang - Powered by Discuz! Mobile Legends: Bang Bang»Forum › Here I come › General Discussion › DO YOU STILL DO THIS? [Poll] DO YOU STILL DO THIS? Do you still play Lucky Spin with tickets? Not including free spin. After the decreased chance rate of obtaining the hero/skin. Or wait for something worth it in Lucky spin then you’ll use? 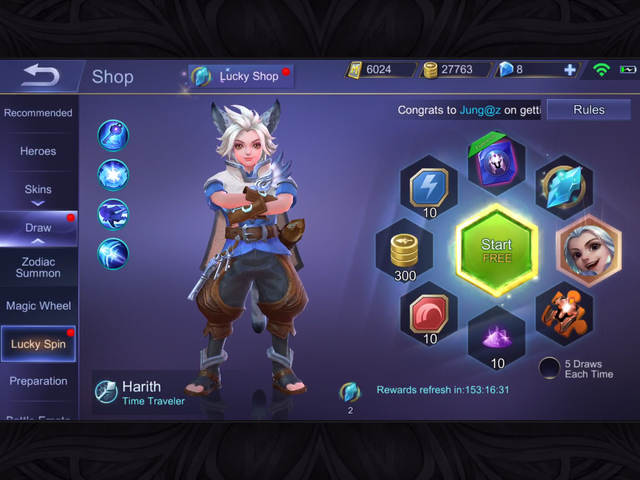 Wow, Harith in Lucky Spin before the nerf that’s coming in 3 days? 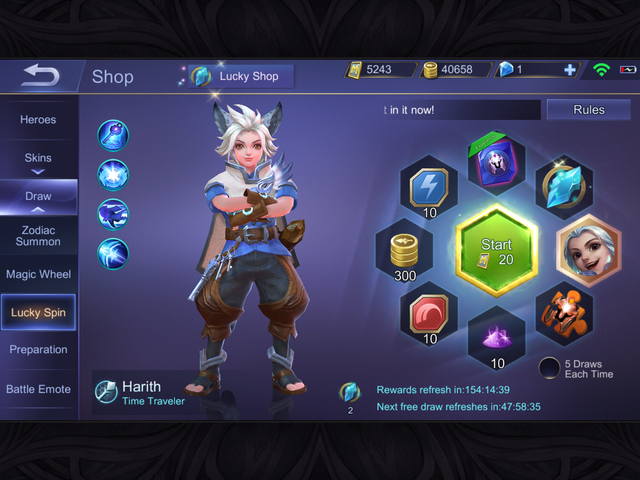 I spent 2,340 tickets to get Harith by going 1 spin at a time. I’ll be trying with another account with 5 spins and look at the chances between 1 and 5 spins. I’m going to change to 3rd account to do the spins.... ._. And ended up with 3,424 tickets with 5 spins each, spending a total of 2,600 tickets. After they added Lucky Fragment into the system, the chance rate of getting Hero/Skin gotten harder by 200%. Even after spending 2000 tickets I still get nothing, before that I could get it under 1500 and it’s a guarantee but not now. I used to spin to earn 10666 battle points or get the hero/skin that I want but I don’t see the point of doing it anymore so I stopped. The item in the Lucky Shop isn’t attractive enough for me to get the Lucky Gem too. So I would give it a slip. I use the ticker once a day for the sake of the daily task and use more whenever there's a good skin/hero available. Only if the skin good.. and besides, i can get more lucky gem anyway.. tho they arent releasing any skins yet to lucky gem shop..
Just keep your tickets. It will be useful in the future. I heard that Alpha Crimson Warrior or Clint Badminton Champion will appear in Lucky Shop. I'm still collecting lucky gems from lucky spin right now, even though I already owned Odette Butterfly and Sun Street Legend. I believe they will put another special skin right there soon. I do 2 tries per day. Second I do to complete my daily quest.